There are a number of ways to do Forex channel trading but here we will focus on the main ways that will be used in this analysis service. The big point is that you never have to watch the screens when trading the channel technique – not even when using the DIAD EA entry. 1. The “Normal” way of trading channels. When a channel entry is identified you can trade it like a normal Forex trade with stops placed in appropriate places or example: – behind support and resistance. Alternatively you can use a basic formula of having stops that are 50% of the Target. 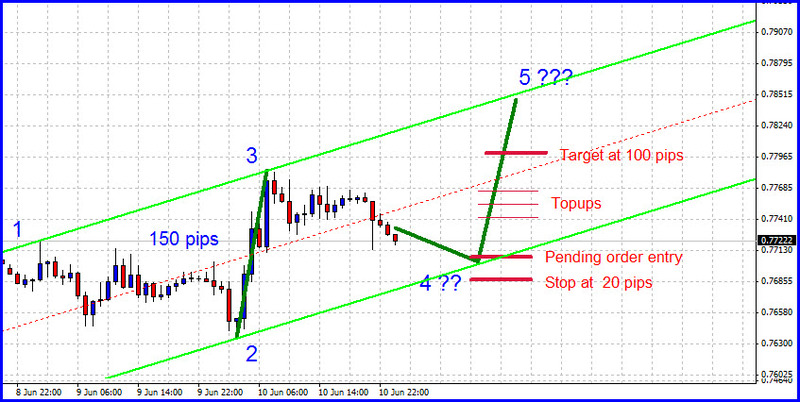 The target is also normally 80% of the expected trend which is normally the width of the channel. 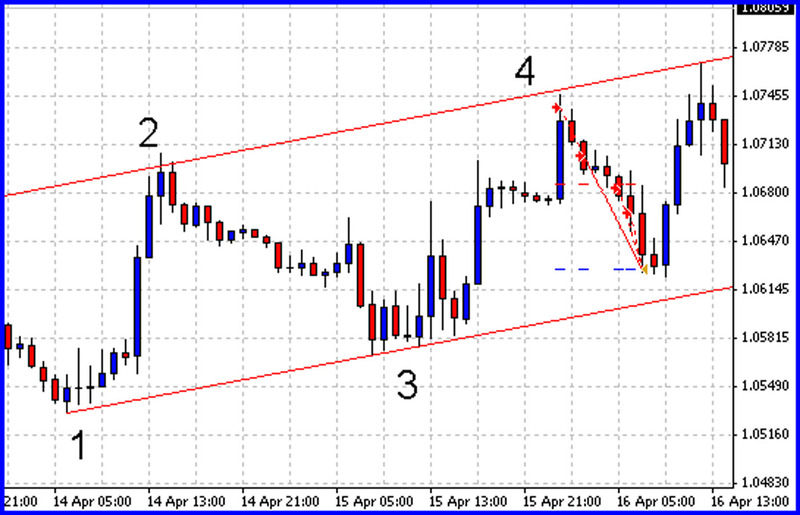 In the example below the channel is setting up for a bounce at 4 to go to 5. The 4 to 5 leg is projected to be 150 pips based on the previous legs. So one would have a target of 120 Pips which is 80% of the full trend. 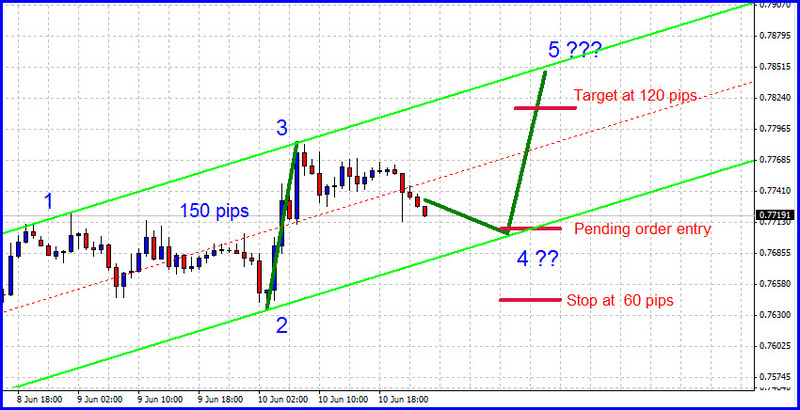 The stop would be 60 pips which is 50% of the target. All the Double in a Day trades in this series will be based on 5% risk to make 105% using a 100 pip trend. You can chose these from the preset provided in your DIAD EA. In the Presets you can chose whether to have Break-even (BE) top up stops or Initial risk (IR) top up stops. Choosing the initial risk option will give you a bigger initial stop and bigger stop up stops. So the big difference in that your stops will be a lot smaller than trading the normal way and because of that your success rate will be much smaller. The double in a day entry is the same. So in the above example you would specify the same price level as your entry in the EA. Because of the smaller stops trading this way is more difficult but that is why the risk return ration is 1 to 21 – so you can afford to have 20 failures and 1 success and still breakeven. Some traders like using bigger stops when using the normal way of trading the channels system. They like using stop twice the size of the targets. So if the target is 120 pips the stop will be 240 pips. This may sound crazy but this shoots the success rate through the roof. So although you now need a success rate of 66% to breakeven the increased success rate makes up for this.